This weekend I read Mark Latham’s recent Sherlock Holmes novel from Titan Books, A Betrayal in Blood. Set shortly after “The Empty House,” Holmes is tasked by Mycroft to investigate the events described in “The Dracula Papers” (ie., what we know as Bram Stoker’s novel Dracula) and determine what, exactly, it was that happened when a Transylvanian nobleman arrived on England’s shores. This isn’t the first entangling of Sherlock Holmes with the characters and events of Dracula — I know of at least six, and I’ve read four — but it’s certainly the most unconventional. 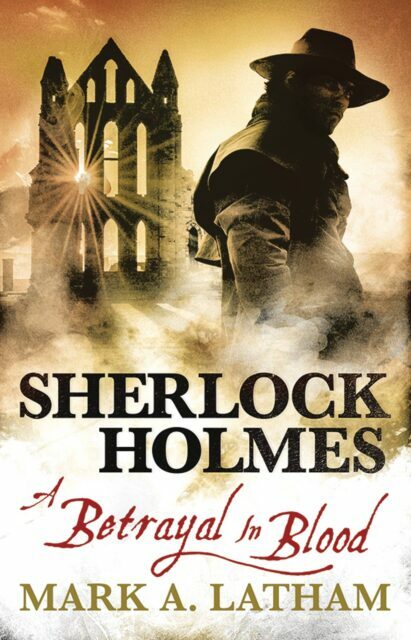 A Betrayal in Blood is a sequel to Dracula, with Holmes launching an investigation into a group of characters hailed in the press as heroes and whether the late Count Dracula was truly a monster or merely a man. Holmes and Watson cross paths with all of the major surviving characters of Dracula, and their investigation takes them to many of the locations of the book, such as Whitby, Carfax Abbey, and the sanitarium run by Dr. Seward. Dracula‘s characters are positioned as accessories to a murderous conspiracy, even criminal masterminds as Holmes seeks to unravel a very human, very rational conspiracy. Alternate theories about the reason for Dracula’s interest in Lucy Westenra and the identity of the Bloofer Lady, among other events from Stoker’s book, are put on offer. Latham’s writing doesn’t feel particularly Watsonesque — the writing is too modern at times, and Watson was never so wordy — though his plot, which is rather byzantine, keeps the pages turning. About that plot, A Betrayal in Blood is more of a howdunit or a whydunit than a whodunit; it’s obvious from the first chapter who Holmes believes to be the guilty party in the Dracula affair and, like a Columbo story, A Betrayal in Blood sees Holmes build his case methodically, finding the evidence and testing his theories against his findings. Holmes is characterized well — he’s a man on a mission, in the throes of his pursuit of justice — though Watson is a little bit of dullard. I feel like I’d have gotten more out of the book if I’d read Dracula more recently than about twenty-five years ago, though nothing in the book struck me as “wrong.” It holds together well, resulting in a revisionist, yet plausible, reading of the events of Dracula. I wouldn’t call A Betrayal in Blood an essential read or a must-read, but it does offer an unconventional and entertaining take on placing Sherlock Holmes into the Dracula story. Though this won’t dethrone Loren D. Estleman’s Sherlock Holmes vs. Dracula as my favorite Holmes/Dracula pairing, this is a worthy addition to my Holmesian library.